Made with natural tuna. Served in a delicate broth. No added artificial colourants, preservatives, or flavourings. 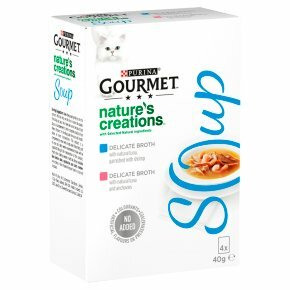 Gourmet Crystal Soup offers a variety of savoury broths for a unique sensorial experience your cat will love. Full of nature's finest ingredients, like real recognisable pieces of chicken or seafood, Gourmet Crystal Soup is a delectable eating experience that will make your cat purr with pleasure. Serving Suggestion: Shake the pouch gently to mix the content. Tear the strip on the top to open the pouch. For a 4-kg cat, pour in a bowl and serve one pouch per day as a complement to other complete products from Purina®. Follow the Feeding Guidelines for your cat's health. Serve at room temperature. Always provide clean and fresh water. This product is a complementary meal with a high level of moisture: part of your cat's daily water recommended intake will be supplied through the consumption of this product.